When we start PeopleSoft Upgrade, target environment (Copy of Production) needs to be setup first so that upgrade steps, scripts can run successfully during upgrade pass. This process involves copying projects, files and other scripts into the target environment. Step ‘Applying Upgrade Planning Files’ involves copying UPGOPT project from new release PS_APP_HOME to the target environment (COP) and then running associated dms scripts. For e.g. if you are upgrading from HCM 9.0 to HCM 9.2, you would need to copy and run UPGOPT_HC90.dms script. With PeopleSoft 9.2 application upgrade, there are cases when you may not find UPGOPT_HC90.dms and associated .DAT file in your PS_APP_HOME. In such scenario you would need to make sure that you had already applied ‘Required at Upgrade’ fixes from your PeopleSoft Image (PI) used for PeopleSoft Update Manager. Required at Upgrade fixes directs you to copy these missing files from staging directory to PS_APP_HOME. 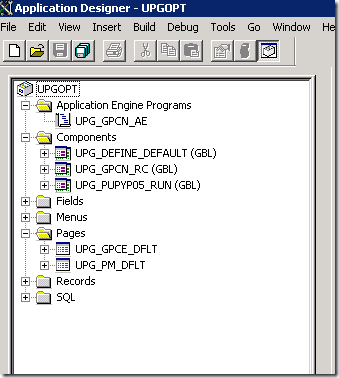 UPGOPT contains Application Engine programs, pages, records , SQL etc. which would be used during the upgrade process. UPGOPT project will be found in PS_APP_HOME/PROJECTS/HC90. UPGOPT_HC90.dms script is used to load access groups, messages and upgrade query trees. After copying UPGOPT project, you are required to generate SQL scripts to build tables, views and indexes. Make sure to review the logs for any warning or errors. Finally you would need to setup the security required by functional team to do the configuration related to upgrade. Please refer to upgrade guide for detailed steps and navigation.